Devart ODBC Drivers is a connectivity solutions for ODBC-based applications to access popular databases directly from Windows, MacOS, Linux, both 32-bit and 64-bit, that support standard ODBC API functions and data types, multiple server data types and features it has direct access to databases and clouds, which eliminates the use of database client libraries, simplifies the deployment process, and extends application capabilities. Work for Devart ODBC Driver? Learning about Devart ODBC Driver? What On-Premise Data Integration solution do you use? Software AG's webMethods Integration Platform is a proven, pre-integrated software suite featuring the market-leading Enterprise Service Bus (ESB) that enables enterprises to rapidly integrate systems, services, devices, processes, business partners and data to provide new business value and improve business performance. Seamlessly integrated with webMethods API and Master Data Managment (MDM), webMethods suports the Digital Business Platform (DBP) which supports the rapid development for next generation applications. Talend offers open source middleware solutions that address big data integration, data management and application integration needs for businesses of all sizes. IBM InfoSphere Information Server is an advanced data integration platform that enables you to cleanse, monitor, transform and deliver data. The scalable solution provides massively parallel processing capabilities to help you manage small to very large data volumes. It helps you deliver trusted information to your key business initiatives such as big data and analytics, data warehouse modernization and master data management. SAP Data Services allows you to deliver information to all your business functions with the ability to integrate, transform, and manage your data at the project or enterprise level. Atlas provides for real-time, two-way integration between Microsoft Dynamics AX and the Microsoft Office System. Centerprise Data Integrator provides a powerful, scalable, high-performance, and affordable integration platform designed for ease of use by your business information experts, yet robust enough to overcome even the biggest and most complex data integration challenges. Oracle GoldenGate is a comprehensive software package for real-time data integration and replication in heterogeneous IT environments. The product set enables high availability solutions, real-time data integration, transactional change data capture, data replication, transformations, and verification between operational and analytical enterprise systems. Neuron ESB is an application, service and workflow integration platform that simplifies messaging, system integration and Web service enablement. Built on Microsoft .NET, Neuron ESB enables you to use existing in-house developer skills, reduce custom development, deliver solutions faster, and cut third-party integration costs. 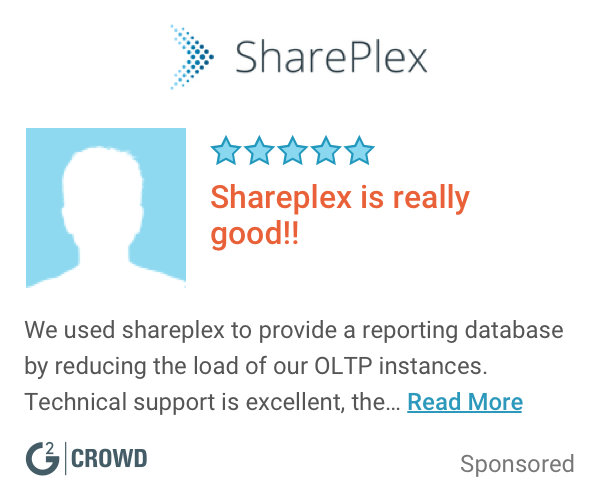 SharePlex is a database replication solution. * We monitor all Devart ODBC Driver reviews to prevent fraudulent reviews and keep review quality high. We do not post reviews by company employees or direct competitors. Validated reviews require the user to submit a screenshot of the product containing their user ID, in order to verify a user is an actual user of the product. Hi there! Are you looking to implement a solution like Devart ODBC Driver?